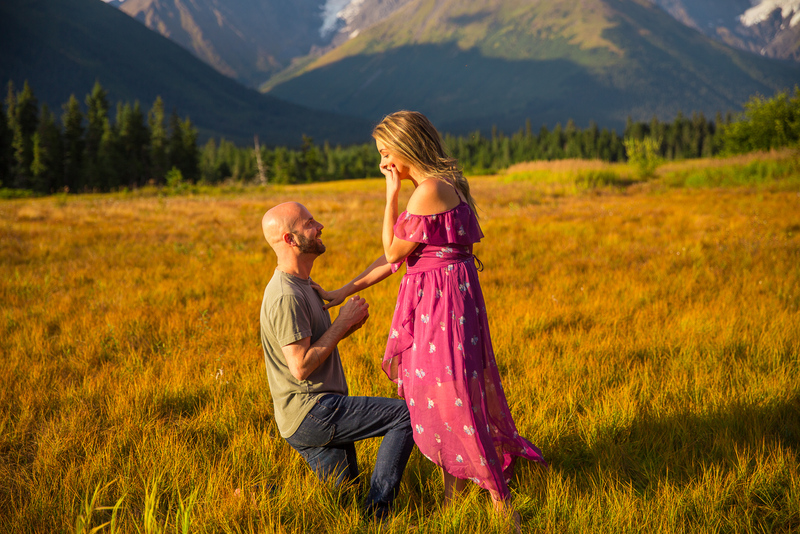 Alaska Proposal; The Time I Almost Blew It. Did you ever know something 100% in your heart, but you almost screw it up? So goes the story of my proposal to Tyler. First off, there was some work that went into this before we ever hopped on the plane… not only in designing the ring, but also discussing my plan with Tyler’s family and with my Ellie. Designing the ring was a fun process. I knew a little bit about what Tyler wanted (ethically sourced diamond, something vintage-inspired), so I worked with Brilliant Earth and loved my experience. While the original estimate was 2 months, I was able to sweet talk and streamline the process. The update on my ring was that it would be ready the Friday before we were heading to Alaska – the plan was working perfectly! Except wait… how would I get the ring? I did some more sweet talking and had them ship it straight to my friend in Alaska. One of my favorite parts of the entire process was talking with Ellie about it. Since Tyler and I are rarely apart, it was difficult finding a time to share everything with Ellie without Tyler knowing. But alas… Ellie’s busy schedule and mine finally aligned (albeit via facetime), and I was able to sit down with Ellie and let her in on my plan. We both laughed and talked about life and how things work out and she shared her heart with me about Tyler and how happy she was for me (bless that girl) and while I won’t write everything we discussed, I did take this sweet screenshot of me sharing the news. How precious, right? Ok on to the actual trip… with excited hearts, we made it to Alaska! I’ve been to Alaska once before to photograph a wedding, but I was traveling solo and didn’t get to enjoy it with someone I cared about seeing cool stuff with, and Alaska is the ultimate cool stuff. I asked Tyler if she would do an Alaska photo shoot with me because my phone is filled with selfies and pictures of her, but none that aren’t selfies of the two of us. When she agreed (because duh) I knew I had a cool way for it to be captured on camera. Check. 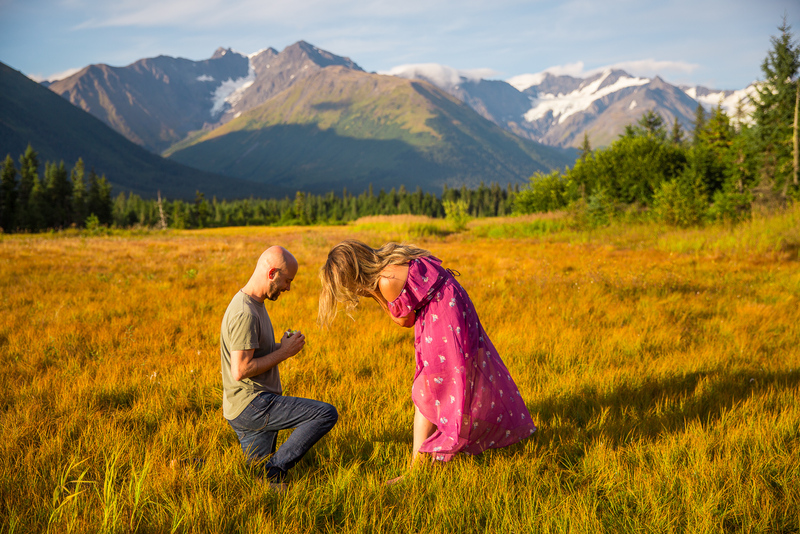 I spent the two days before the proposal hiking and roaming Alaska with Tyler, and while she thought we were sightseeing, I knew it was because I wanted the perfect backdrop for the knee drop. Lighting was important bc the ring was supposed to arrive around noon so I needed later evening for pretty light, but shooting in Alaska is tricky because of the mountain placement. However, our hiking efforts were not in vain because I found the perfect spot in the perfect light near the Alyeska resort (more on that later). So here’s where the story takes a turn. I didn’t expect to be a ball of nerves. On Monday, the day before the proposal, we were exploring downtown Anchorage and I was a bit of a wreck in my head. All of a sudden we were sitting there having a drink, and it was like I wasn’t even in my own body but watching from above… I started a ridiculous argument with Tyler. And then when we made up, I brought it back up. Sometimes I can be a complete idiot. Thankfully, Tyler loves me anyway. See? Tuesday was proposal day. Right at noon, my friend sent me a text about pictures, which was code for “the ring has arrived and looks beautiful” so it was GO TIME. I tried to move the proposal up to 12:01 to get it out of my mouth, but Tyler (nor I) was picture ready. We played around town during the afternoon and then checked in to our new hotel (the Alyeska Hotel, which was near the proposal site. It’s a wonderful hotel with mountain-top restaurant) to get ready for our photoshoot. Our friends who were shooting our pictures met us at our hotel, and Sean and I had to use the restroom at the same time; our little cover-up for passing the ring over to me. I had purchased a box from TheMrsBox which I had already hidden in my pants pocket – hoping it wouldn’t cause a ridiculous bulge. Off we go to the site I had chosen. The light was beautiful. Warm, near-sunsetty light hit us perfectly. I gave Sidra my camera, which I had set for exposure and let her do her thing. I kept running back and forth from Tyler to Sidra, working up the nerve to do the thing (but pretending to check images on the back of the camera). Then I did the thing. I said a few things I’d been wanting to say to Tyler, and she still had no clue. I mean, c’mon… it must be because I’m always so sweet, haha! After I said what I had wanted to say to her, I dropped to a knee and she was so surprised! It felt wonderful to give her a surprise because 1) she loves surprises and 2) she’s kind of awesome at figuring things out before they happen (which, I think, makes her a very good lawyer). Success! then of course we high-fived (and kissed) because we’re completely awesome. After our photoshoot/proposal ended, I took her up to the mountain-top restaurant. I had made reservations for us and talked to the chef previously so that we could order a vegan meal (there were zero vegan options on the standard dinner menu, but I REALLY wanted to eat at that location, with that view). The chef didn’t disappoint, nor did the view. Our view going up the mountain to dinner (above); my sweet fiancee with her ring (below). The rest of trip, I felt like I was flying. The coolest, funniest, sexiest, most lovely and talented woman I know has said YES to marrying me. What is life? I couldn’t be more blessed, more thankful, more undeserving, or more excited to marry Tyler. P.S. 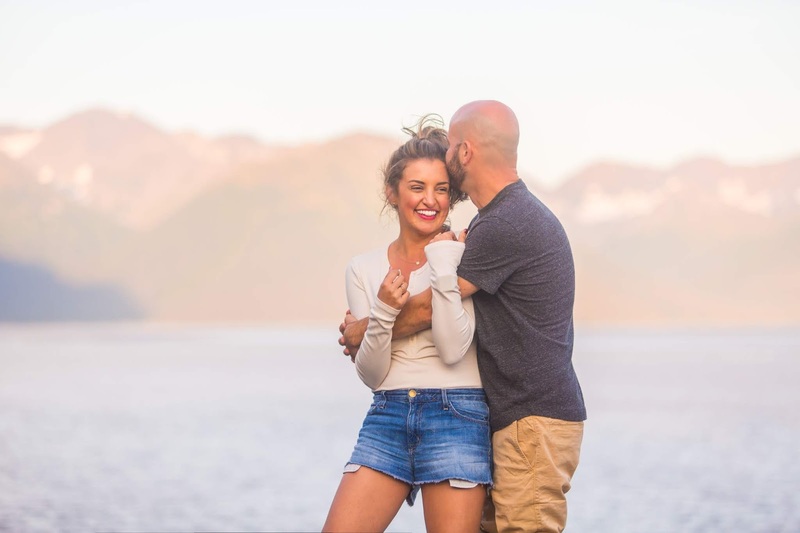 If you want to read Tyler’s account of the proposal, head to her blog.